Another great award for our 3D Packaging Design! 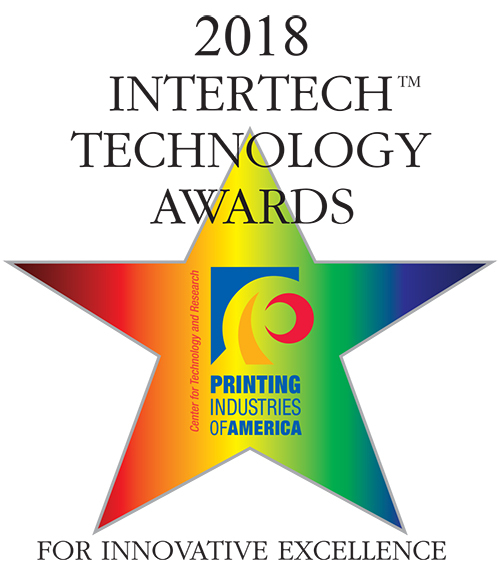 The InterTech™ Technology Award is the most important award for innovations in the graphic arts industry in the USA – if not worldwide. It is bestowed by the Printing Industries of America (PIA), the world’s largest industry association. The PIA has awarded our printQ 3D Packaging Design. “The judging committee is comprised of industry executives and technology officers. The award standard is a technology that’s judged to be truly innovative and likely to have a significant impact on a major segment of the industry”, said Jim Workman, Vice President of PIA’s Center for Technology and Research. Cloud Labs’ new 3D Packaging Design allows customers to build and design their packaging themselves! All sorts of graphical content and customizable sizes and shapes for the product are possible. The key innovation is the dynamic creation of a 3D model within milliseconds. It is possible to design a variable sized packaging product according to your individual requirements and artwork. Thanks to the instant preview that is generated dynamically you will see what you get: a realistic 3D visualization of your own packaging product – in any size. We are very happy about this award. It confirms once again that our constant development work paid off. printQ takes eCommerce print solutions, web to print and online print shops to a whole new level. More than that, it heralds the beginning of a new era in the print industry. printQ is based on the world’s leading eCommerce system, Magento, with an open and flexible architecture, and its thousands of extensions make it easily extendable, simple to sophisticated. CloudLab offers non-stop project development: Engineering, layout implementation, implementation of desired features, changes in workflow, as well as project management.